I wrote a small post about Wufoo already, and since I just recieved my beta key here is a short follow-up with the first form I created with Wufoo. Just to be brief, this is one goodawesome form creator. Let’s say I wanted to setup a small survey? Wufoo is the tool of choice – no HTML knowledge required, heck – not even a website is needed since I could invite people via Wufoo right away. Really stunning. And it’s fun too – I am not sure if anyone remembers that setting up a form was this much fun. Once I finished the form I could “download” some code to paste it into a site (an iframe), but Wufoo also provides me with raw HTML and CSS so I could use that to make my form blend in with my website. If not familiar with HTML and design, there are also a couple templates to choose from to spice it up a little. Whatever road you take – the data is always submitted and saved at Wufoo’s server. So you are hosting a single HTML page at the most. This also shows the direction where Wufoo and most services lately are heading: an ASP modell. Once completed, you have a nifty screen inside Wufoo where you can review entries, edit and do whatever else you please. Very well done. Playing around, I am amazed by the easyness – Google could not have done any better. There’s a similar, detailed review of Wufoo, including a live data-entry form and several screen captures, plus links to other AJAXified formbuilders at http://oakleafblog.blogspot.com/2006/07/wufoo-challenges-infopath-for-form.html. There is another online forms builder out there called The Blue Form. 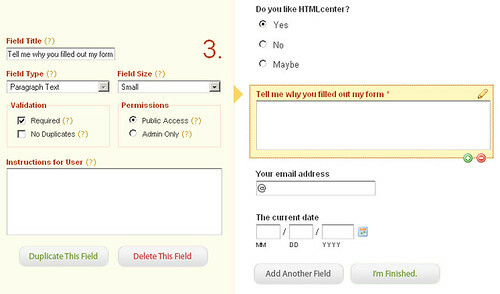 It features an AJAX style form builder as well as the ability to assign approval workflows to the forms. This makes it more of an online process automation / eforms workflow site rather than just a form builder. It could be used in most office type environments to automate paper based processed. We are currently trailing it at the company where I work and the reception has been quite good.